(11:38 a.m. EST) -- Silversea is now taking bookings for its 2020 world cruise on Silver Whisper, currently sailing on this year's around-the-world voyage. It will be the first ship to call on all seven continents during a world sailing. 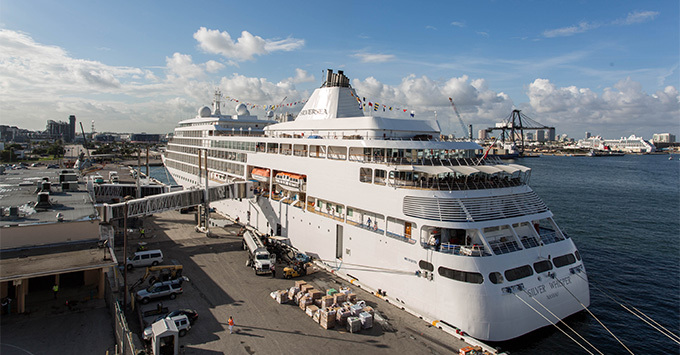 The 140-day voyage will depart from Fort Lauderdale on January 6, 2020, and end in Amsterdam on May 25, 2020. Silver Whisper will visit 62 ports in 32 countries -- including a stop in Antarctica. The route takes the ship from Florida through the Caribbean, down the eastern coast of South America and to Antarctica before rounding Cape Horn and heading to the Chilean fjords, then across the sea to the South Pacific and Australia. The ship will then set a northeasterly course through Southeast and East Asia, through the Gulf of Aden and Red Sea then into the Mediterranean, finishing up with ports in Ireland, the U.K. and the Norwegian fjords. "This itinerary not only demonstrates Silversea's destination expertise and willingness to innovate, but also our care and attention to our guests' preferences: we have sought feedback from our most loyal World Cruisers in order to create the only seven-continent World Cruise available," said Barbara Muckermann, chief marketing officer at Silversea, in a press statement. "In utmost luxury, guests will witness unforgettable spectacles, experience unexpected events, and can enjoy a tailor-made collection of overland programs. Silversea invites the curious, the adventurous, and the pioneers of travel to experience the earth's most authentic beauty, which remains out of reach for most." Other highlights include members of Silversea's Expedition team onboard to enhance the experience, special onboard events and land tours available before, after and during the cruise for those who want to explore a region more in depth or visit key attractions more inland. Full world cruise fares include round-trip business air travel, $4,000 onboard spending money per suite, unlimited Wi-Fi, an expedition parka, laundry and medical services, and visa packages. Fares start at $62,000 per person and go up to $250,000 per person for the Owner's Suite.